5-HTP is a natural sleep promoter, increasing Melatonin and Serotonin to create inner calm and restore a natural sleep cycle. These capsules will help you improve your Circadian Rhythm. One a day, 100 mg high strength. Extra Value Special Price for 3 Packs of 100 vegetarian capsules. MANUFACTURED BY LONJEVITEE to give you the very best quality with no nasty fillers and unnecessary additives. NEW - MANUFACTURED BY LONJEVITEE SO THAT WE CAN GUARANTEE THE PURITY OF THE PRODUCT AND OFFER YOU BETTER VALUE FOR MONEY TO HELP YOU IMPROVE YOUR CIRCADIAN RHYTHM. Free from Silicon Dioxide, Magnesium Stearate, Preservatives, GMO, and Irradiation. 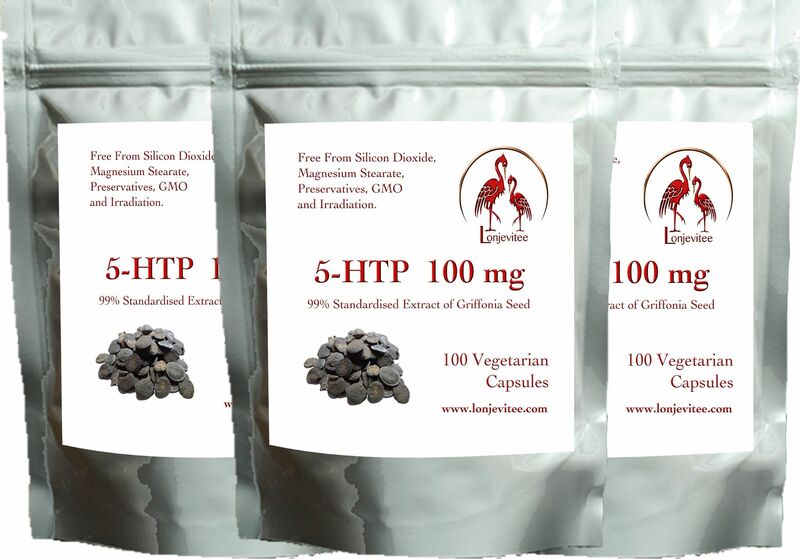 We chose the purest extract of Griffonia seeds available anywhere to ensure the highest quality you’d expect from a 5-HTP supplement. Because the quantity of 5-HTP is too small to fill a capsule, we add pure organic rice protein. 5-HydroxyTryptoPhan is a natural amino acid compound, known to increase Serotonin and Melotonin, which helps maintain a happier mind and a better Circadian rhythm. 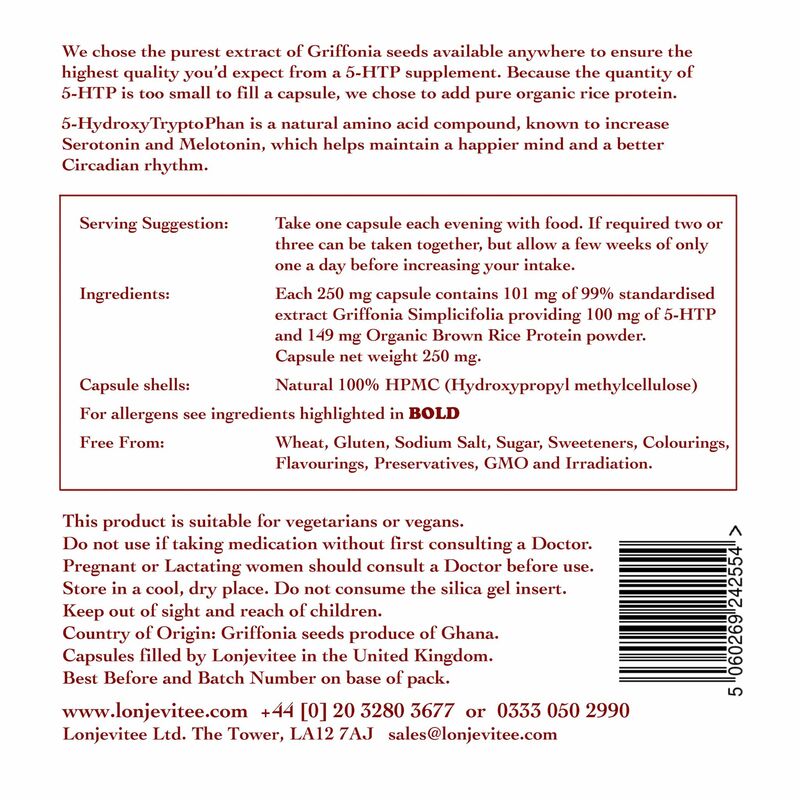 Ingredients: Each 250 mg capsule contains 102 mg of 99% standardised extract of Griffonia Simplicifolia providing 100 mg of 5-HTP and 148 mg Pure Organic Brown Rice Protein powder. Serving suggestion: Take one capsule each evening with food. If required two or three can be taken together, but allow a few weeks of only one a day before increasing your intake. Country of Origin: Griffonia seeds from Ghana. Capsules filled by Lonjevitee in the United Kingdom.